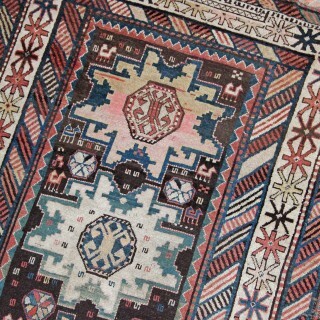 A beautiful soft and decorative Antique Kazak kelleh rug, with a 5 star design we see in Lesghi Caucasian rugs. 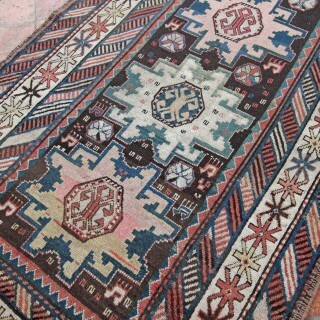 Dating from the late 19th Century the condition is good with generally a nice wool pile throughout. 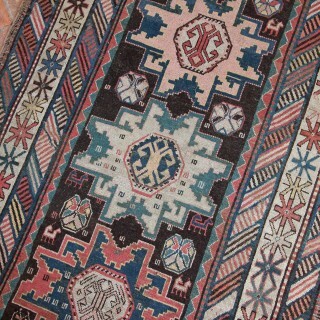 The fringes are short but no losses to the rug design at the ends. 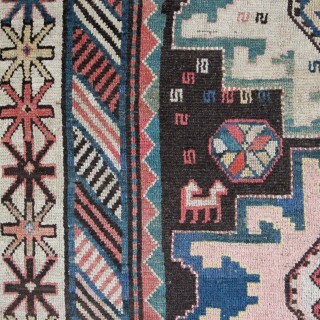 These antique caucasian rugs are great to work in contemporary settings as well as traditional, their interesting designs and colourful palette bring a lot of charm and character to a floor and room. Look for the small animals such as birds and horses and small side-way S symbols which are reference to the sun. 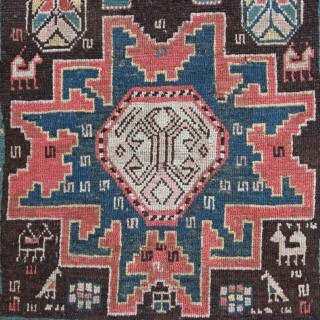 The wool is extremely soft with good rug underlay it would sit happily on a wood or carpeted floor. 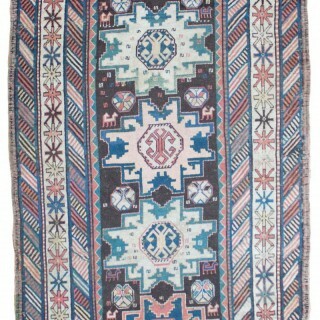 Rugs bearing this name come from the highland area of the Caucasus whose centre is the town of Kazak. 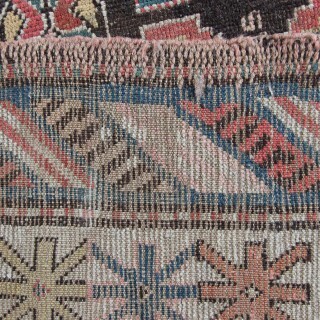 Woven by semi-nomadic shepherds of the region. They use fabulous vegetable dyes and soft to touch quality hand spun wool from their own herd. 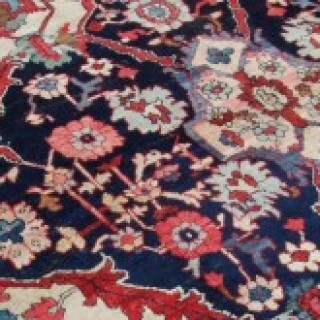 We offer the service of viewing any of our carpets & rugs in-situ in London, Surrey, Hampshire & the UK by appointment. 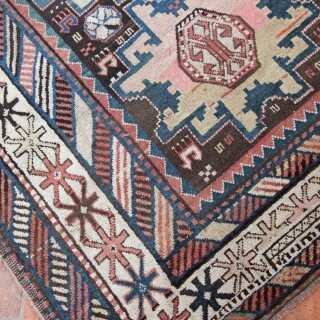 Please request a home visit to see this antique Caucasian rug in your own home to see how it works with your interior. 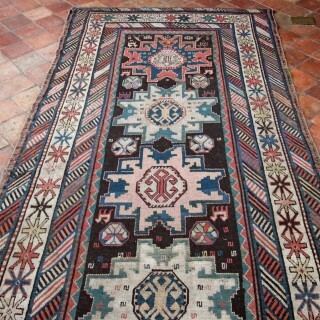 Or we would love to welcome you to our barn showroom in Crondall, Surrey. In general it is in good condition, with a medium wool pile all over. Some tiny areas of wear but nothing significant. 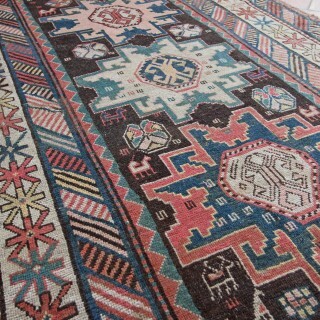 No repairs or stains, washed by ourselves and ready for the floor. Over 120 years old, in great useable order for its age. We always include high quality underlay for any rug purchased from us which keeps the rug secure on the floor and stops it from moving.